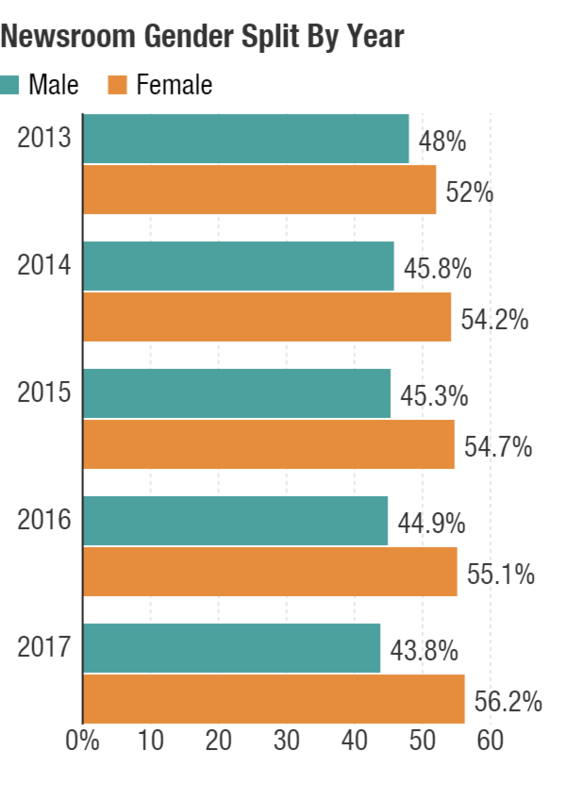 NPR's Staff Diversity Numbers, 2017 : NPR Public Editor Keeping on trend since 2012, the race and ethnicity numbers showed only incremental change. The NPR newsroom by race and ethnicity as of Oct. 31, 2017. 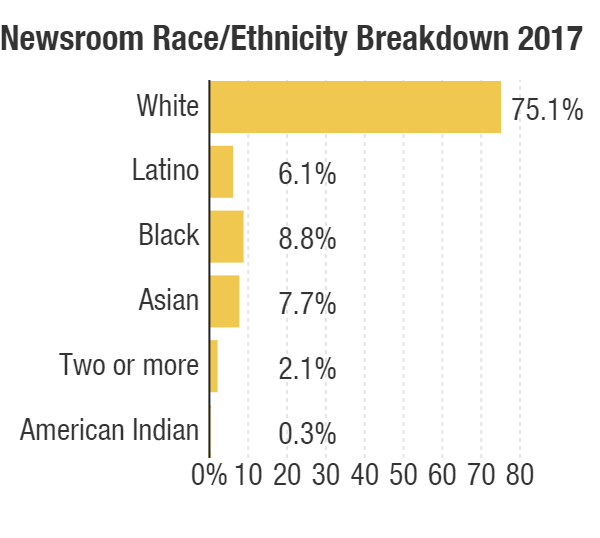 It's time for our annual update on the racial, ethnic and gender diversity of the NPR newsroom. The overall racial and ethnic diversity of the news and information division remained virtually unchanged as of Oct. 31, 2017, when compared with the year earlier. Figures supplied by NPR's human resources department showed the division of 377 people to be 75.10 percent non-Hispanic white (as self-identified). That compared to 75.4 percent the year earlier, when there were 350 newsroom employees. I'll repeat what I said of the 2016 numbers, which showed only incremental change over the last five years: this was a disappointing showing. Year-to-year, there were some small changes in the makeup of the remaining 25 percent of the newsroom. The percentage of employees who reported they were Latino or black rose slightly; Asian employees as a percentage dropped slightly. The exact numbers can be found in the accompanying charts. As for gender, the newsroom was 56.2 percent female as of Oct. 31, up one percentage point from a year earlier, and the highest number in five years. I wrote about the race and ethnicity numbers last April, and talked then to many employees about their deep concerns and frustrations over the lack of progress and what they saw as the causes and ramifications. That column also included an assessment of how NPR's numbers compare with those of other newsrooms. I won't repeat that assessment here, but putting the company in the context of its peers is a valuable perspective, as is hearing from a wide range of newsroom employees. The overall racial and ethnic diversity of the news and information division remained virtually unchanged. Some people in upper management made the point last April that significant changes had contributed to NPR sounding more diverse on-air, despite a lack of change in overall numbers. Two top newsroom executives made similar points to me in recent weeks, arguing that the raw numbers do not reflect some of progress made on the issue. I'll give them their say here. Christopher Turpin, who assumed interim leadership of NPR's newsroom in November (for the year in question he was the deputy leader), told me recently when we sat down to discuss priorities for the year ahead: "I am very proud we've made some good high-level diverse hires," including at the deputy managing editor level and among those who lead the newsmagazines. He added: "I think that we obviously have a huge amount of work to do, but I do think that within those numbers, even though those numbers have stayed fundamentally unchanged, there are some very positive signs. Obviously we're all committed to doing better." One area he called out in particular was the hiring of Latinos. "I think we have done a very bad job around Latinos and diversity," he said, adding that he would like NPR to finally make progress in that area in 2018. "I think it's an area where our coverage really suffers from the lack of people who have insight into a community." Keith Woods, NPR's vice president for newsroom training and diversity, also told me he believes that the lack of change in the overall newsroom picture does not reflect progress that has been made. "There is something to be said about the leadership of this organization at the moment," he said, with a senior leadership team that has shifted in the past couple of months from overwhelmingly white male to majority female and decidedly more diverse. Going down to the next level of leadership, he added, there have been significant changes, as well (as Turpin noted, in the deputy managing editor ranks and show leadership). I agree with that assessment (and hope those changes at the top trickle down more widely). Still, the newsroom expanded last year, by 27 positions. That seemed to me like an opportunity to help shift the overall numbers. Woods said NPR filled 82 positions in 2017 as of Dec. 21 (a slightly different time period than the year-to-year figures). Those included promotions into new jobs, conversions from temporary posts to full time, and the hiring of 35 people new to the company. Of those 82, 30 were people of color, he said, or 37 percent. More than 60 percent were women. Of the 35 new hires specifically, he said, 46 percent were people of color (and 63 percent were women). That the overall newsroom numbers didn't change significantly, Woods said, "underscores how difficult it is to make the percentages move even in a year when we've had that level of focus and success." He said the challenge is retention. That challenge includes routine poaching attempts by other news organizations, some of which can pay more than NPR. A new Corporation for Public Broadcasting grant, several years in the making, is funding a project designed to "drive diversity in news coverage, audiences and staff." Woods initiated this effort, but it is not an NPR program. Five employees have been hired at four stations, for what Woods called "an opportunity at its best for stations to deepen their understanding and coverage of the topic and make diversity stick." Still, he said, "I fight constantly the urge to celebrate incremental progress because it's incremental, but the challenges we face to expand range from the finding of grant money to holding onto people. All of that has the impact that it does on our ability to grow quickly." A few other notes: Woods pointed to existing projects at NPR, including Luis Clemens' work helping former NPR Diversity interns get jobs across the public radio system; the NextGen program, partly funded by NPR, that introduces young journalists of color to public radio; and the Public Media Village recruiting effort at annual conferences for journalists of color. More recently, he said, every regional training program for member stations now includes a diversity component, which has vastly expanded the number of stations taking part. NPR itself in the past year has put in place "a far better system" for training journalists joining NPR, including diversity training. News managers across NPR are also receiving leadership training, which includes a diversity component. A newsroom mentoring program is being launched, although it is not specifically focused on diversity. Mentoring, Woods said, is "important for everybody and particularly important for women and people of color." Employees I've talked to would agree with him there. Some women of color in the newsroom recently started putting together their own mentoring program in their free time. As one unsatisfied employee told me, "this should have been done by the company." As part of our recent conversation about the NPR newsroom's priorities ahead, Turpin talked about efforts in the newsroom to recover from the turmoil that followed the Nov. 1 ouster of newsroom leader Michael Oreskes amid charges of sexual harassment. These efforts include a re-evaluation of NPR's newsroom culture. For many in the newsroom, issues including harassment (of all kinds) and diversity are linked, and can't be looked at in isolation. These employees continue to look for significant changes in both areas, and I've heard some tentative appreciation of the steps taken so far to address broader cultural issues. Does this column sound like a repeat of ones I've written in the past on the topic? Yes. I believe it's important to bring continued transparency to the numbers, even if — especially if — they don't change. Look for the annual update a year from now. Perhaps this will be the year when the numbers finally move.